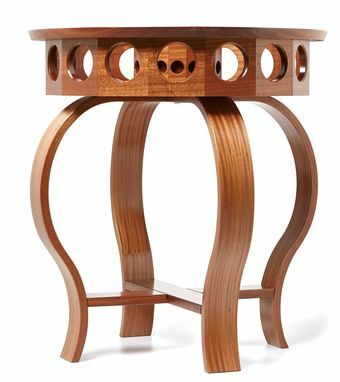 The Don Vino wine table is a Chicone Cabinetmakers original design. This piece of studio furniture was inspired by the oak barrels nestled in the cellars of our many regional wineries. An influence seen mirrored in the table's hand bent barrel legs. The Don Vino not only offers contemporary styling but also a tasteful showcase for your wine collection. We offer a range of American Hardwoods including oak, cherry, maple, and walnut. Exotic hardwoods are also available (standard pricing may vary depending on wood selection). Each order is custom built by hand, so the table can be tailored to fit your special application. 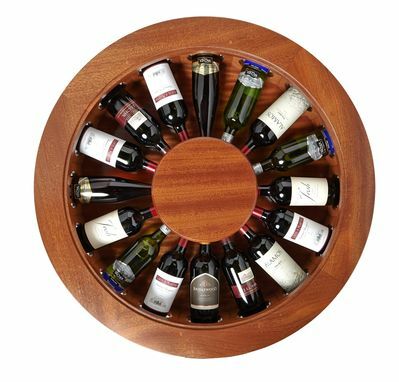 Add functionality to your wine cellar or winery; use the tabletop to transform a simple wine barrel into an elegant counter for your barrel room tastings. We can use the tabletop design to create high rounds for your tasting room or wine bar. 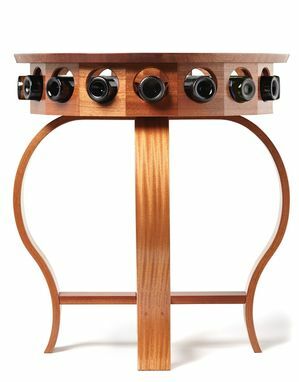 The bistro table is 36 inches tall with a 33 ¼" diameter and holds up to 16 bottles of your favorite wine.